The last two posts just covered a basic overview of how Scheme’s syntax works and was kind of a way to just expose people to the language. This post is going to cover how you can use recursion in Scheme. 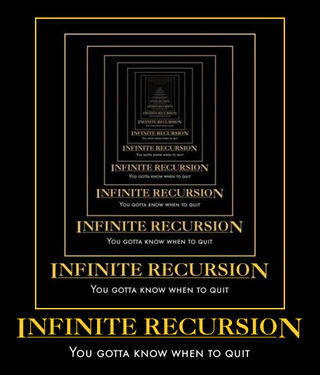 There are two very common mathematical examples that are always used when talking about recursion in programming. The first is computing a Factorial and the other is the Fibonacci sequence. Who am I to buck tradition? First, we’ll look at the Fibonacci sequence. The first 10 numbers of the sequence are 1 1 2 3 5 8 13 21 34 55. Here is how we would implement that in Scheme. 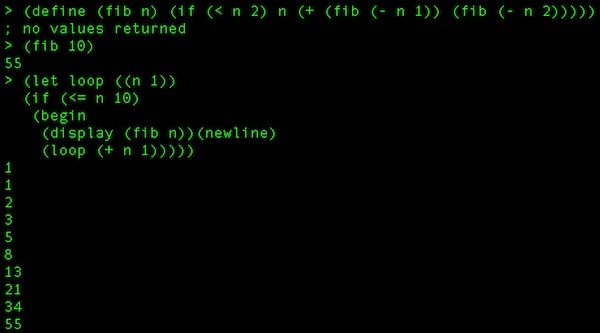 That function calls itself recursively to figure out what the nth digit of the Fibonacci sequence is. So, if we’d like to see it print out in a chain, we can just call that function in a loop. Here is something interesting. Because Scheme is dynamic with its type system and this function can return anything, I can actually work with really large numbers. For example, here I call the function twice, once with 5 to return 120 and the second time with 50 to return 30414093201713378043612608166064768844377641568960512000000000000. That is obviously WAY too big to be returned with any native .Net data type. Also, both of those calls returned as quickly as I hit Enter. Up until now, there isn’t much special about these recursive functions. However, Scheme does allow something that C# doesn’t allow (well, it can in very special circumstances) and that is tail recursion. This is also (sometimes controversially) called tail optimization and is something of a hallmark of functional languages. Traditionally, for every method/function/procedure call you are making in a language, you are building on the stack until that method/function/procedure returns. You see this all the time when you look at a stack trace while you are debugging. However, when you recursively call the same method over and over and over again, you risk a stack overflow. Imagine I wanted to find out what 50000! was. I would be putting 50000 function calls (all to the same function) on the stack and depending on the architecture I was on, I could overflow the stack (on my Macbook Pro, it did return after a few minutes with a VERY large number – pages and pages of scrolling). What tail call optimization does is “discard” the stack up to the point when it calls itself again because the function will just be returning itself, so it doesn’t need to keep track. If that sounds wayyy insane, let’s think about our terms. First “tail position” refers to the last thing that happens in a function before it returns. In the case of tail recursion, the last thing that occurs is a call to the function itself. Even though it looks like my factorial example from earlier might be tail recursive, it really isn’t. Here it is again. Take notice of the last line: (* n (factorial (- n 1))). You see how the last thing the function does is multiply the number passed in (n) against the result of the function called again with “n minus 1”. So, we can’t just jump ahead to the new function and only return its results because those need to bubble up the stack, being multiplied against the function’s original n all the way up. What we need to do is track our own progress, so that the function doesn’t need to be multiplied by anything outside of itself. One thing we could do is just take the accumulation as a second parameter, but that is relying on the caller of the function to kind of do something unnatural and not obvious when calling the function. What we’ll do instead is declare a local function inside of our function and call this local function with our parameter and a variable that accumulates and tracks our state. Hopefully, that is fairly clear. I’ve actually had this post in the hopper for some time while I wrapped my head around exactly what we were accomplishing here. Then, when I thought I had it and it was time to write, I still wasn’t prepared to explain it clearly. I hope that the combination of the formatting, comments, and verbose variable names helps you to understand it. I know that it helped me out a great deal. In my severely-commented tail recursive case, it doesn’t have to do that. It loads the function onto the stack and it keeps it there. Every definition describes that it basically does a GOTO and just keeps calling back to the top of the function (the inner function) over and over again. Because we keep our own state, the last thing to evaluate is just returned because the last value of the function is the answer. replace arguments with (5 1), goto "inner_factorial"
replace arguments with (4 5), goto "inner_factorial"
replace arguments with (3 20), goto "inner_factorial"
replace arguments with (2 60), goto "inner_factorial"
replace arguments with (1 120), goto "inner_factorial"
replace arguments with (0 120), goto "inner_factorial"
I know we’ve covered a lot here, but this is good solid computer science stuff. It definitely doesn’t hurt to think about it from time to time and really understand what is going on with the computer and within our languages when we write our code. If you have any questions, or want me to try to clarify something, let me know in the comments and I’ll do the best I can.